A brilliant high-concept thriller - a debut with all the intrigue of Gone Girl and the drama of Before I Go To Sleep - just how do you solve a murder when you can only remember yesterday? 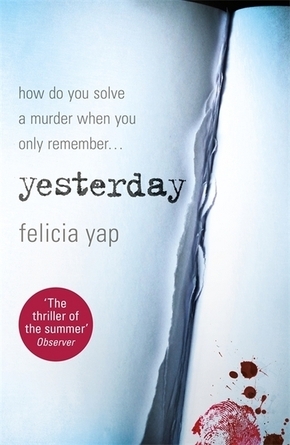 A brilliant high-concept thriller - just how do you solve a murder when you only remember yesterday? Today, the police are at your door. They say that the body of your husband's mistress has been found in the River Cam. They think your husband killed her two days ago. Felicia Yap grew up in Kuala Lumpur. She read biochemistry at Imperial College London, followed by a doctorate in history (and a half-blue in competitive ballroom dancing) at Cambridge University. She has written for the Economist and the Business Times . She has also worked as a radioactive-cell biologist, a war historian, a Cambridge lecturer, a technology journalist, a theatre critic, a flea-market trader and a catwalk model.